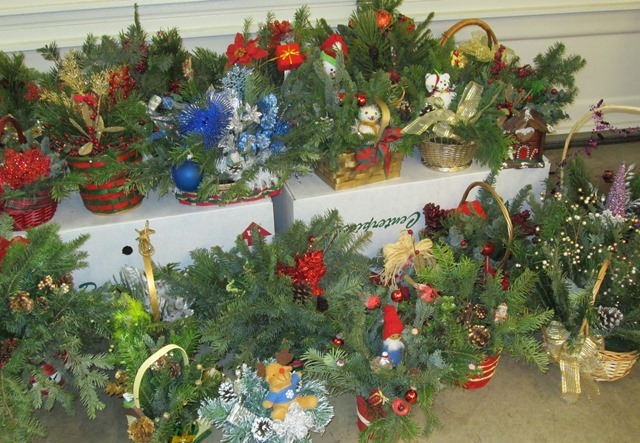 A big 'thanks' to the SI Bend members who got together to create Christmas centerpieces for those in need. 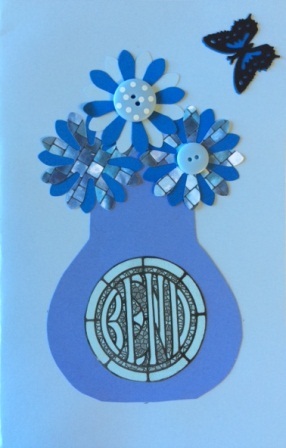 Family Kitchen was delighted with the 17 centerpieces we gave them to place on their tables. Meals and Wheels was very appreciative of 28 centerpieces we provided them to take to patrons in our community along with their meals. Thank you to all of those who participated: Margaret Wyman, Margaret Thompson, Eloise Whitelaw, Kris Jennings, June Brown, Susie Fagen-Wirges,Marty Smolenski and Annie Barlow. It was a most enjoyable and creative time together. We will do it again next year, too and invite all to join us. 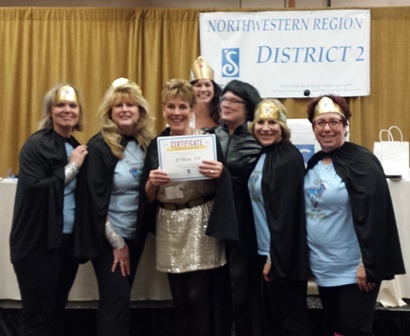 President Terri Swendsen (center) receiving awards at District 2 Conference. 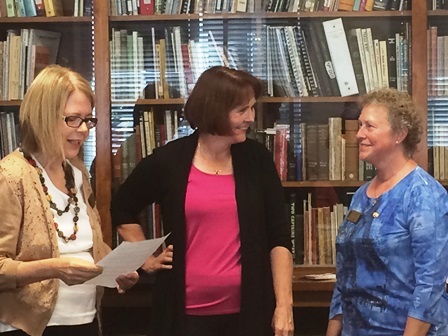 Harmony4Women presents contributions to Bend organizations from their November 2014 concert. 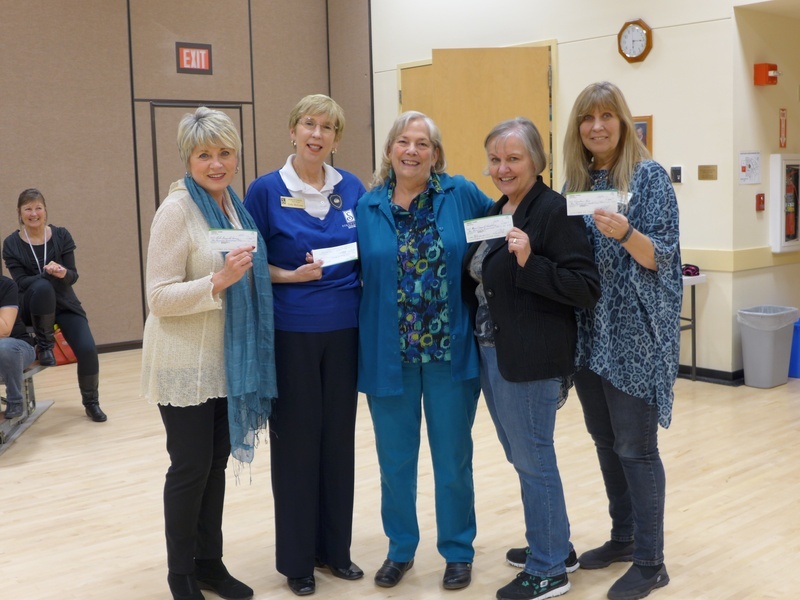 Receiving organizations are (from left to right) Bella Acappella Harmony, Soroptimist of Bend, Harmony for Women, AAUW and Grandma's House. 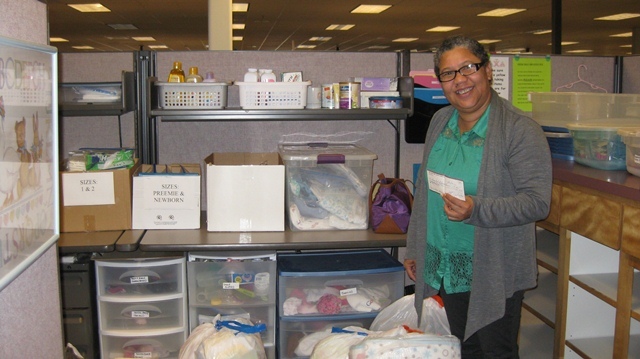 Soroptimist of Bend delivered items collected from the Community Baby Shower to Therese Helton, Deschutes Health Services Community Development Coordinator. Thanks to the support of the Bend community over 800 items of clothing and baby care items were delivered to DHS to help meet the needs of the community over the coming year. A special "THANK YOU" goes out to all who allowed us to put a collection bin at their location, as well as to all the nameless individuals who spent countless hours knitting, crocheting and quilting items to wrap around the babies in our community! Soroptimist of Bend members met early Sunday morning to serve a warm homemade breakfast to residents of Bethlehem Inn. 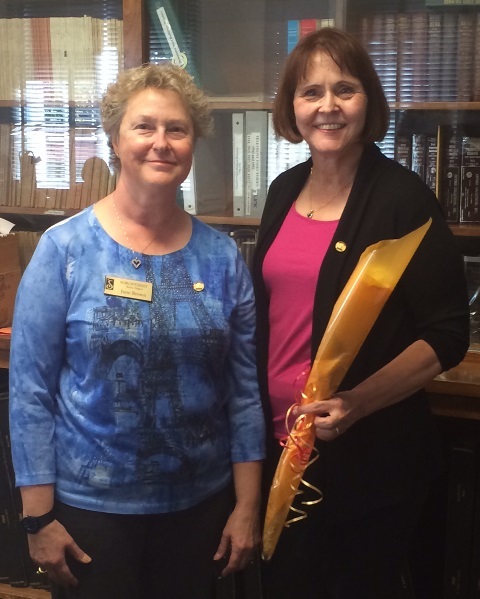 Soroptimist of Bend also purchased and donated a new dvd player to be located in the family residence common area, as well as, a large selection of movies for families to enjoy together! The Women's Opportunity Award (WOA) is given to women who are entering and/or enrolled in college certificate or degree programs, are head of household and have a financial need. 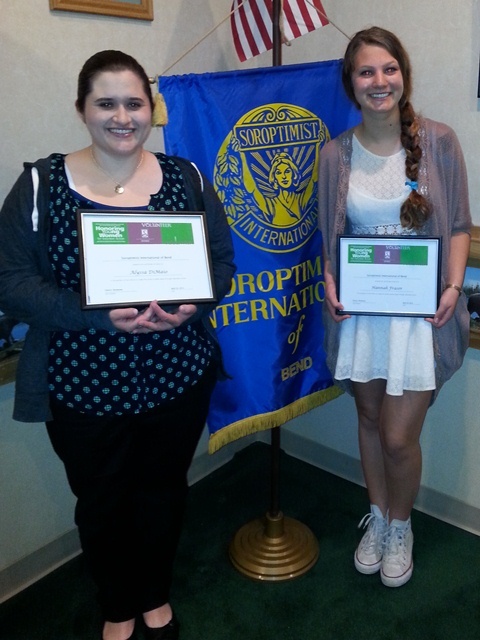 This year, SI Bend awarded two women with a WOA in the amount of $1500, Johannah Quinlan from Bend and Jacqueline Clements from Burns. 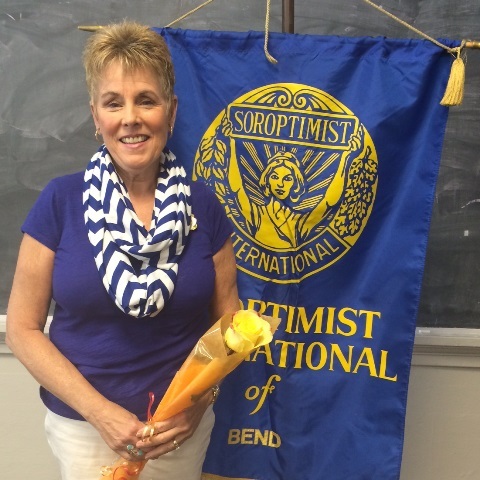 Two Violet Richardson Awards were given at the Soroptimist International Annual Awards Luncheon in the amount of $500 each. This award is given on the basis of a young woman's commitment and accomplishments toward making her community and the world a better place through volunteerism. Summit senior, Alyssa DiMaio has shown her community dedication by volunteering at Grandma's House for the past four years. Her contributions included organizing donations of food and clothing, assisting the Executive Director at community events, giving presentations at schools, as well as being a mentor to the residents of Grandma's House. 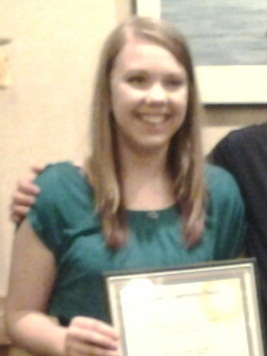 Alyssa also has worked part time at Kid's Club at the Athletic Club of Bend caring for infants and toddlers. She will be attending Gonzaga University in Spokane in the fall. Hannah Fraser, also a Summit senior, has shown her community spirit with her work as the president and community service coordinator of Summit's Interact Club. 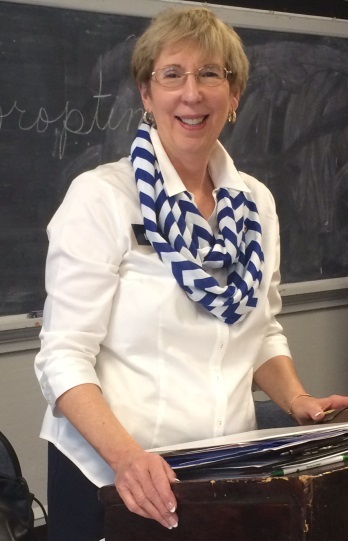 During her tenure, Interact has in partnership with the local Rotary, funded water filters, volunteered with struggling students, volunteered at the Boys and Girls Club and organized nights to feed the homeless. She intends to continue volunteering at the Eugene Boys and Girls Club in the fall where she will attend the University of Oregon Robert D. Clark Honors College. Bend, OR. With unprecedented excitement, the Harmony4Women Leadership Team announces the addition of two new partner-organizations to the Harmony4Women Team. 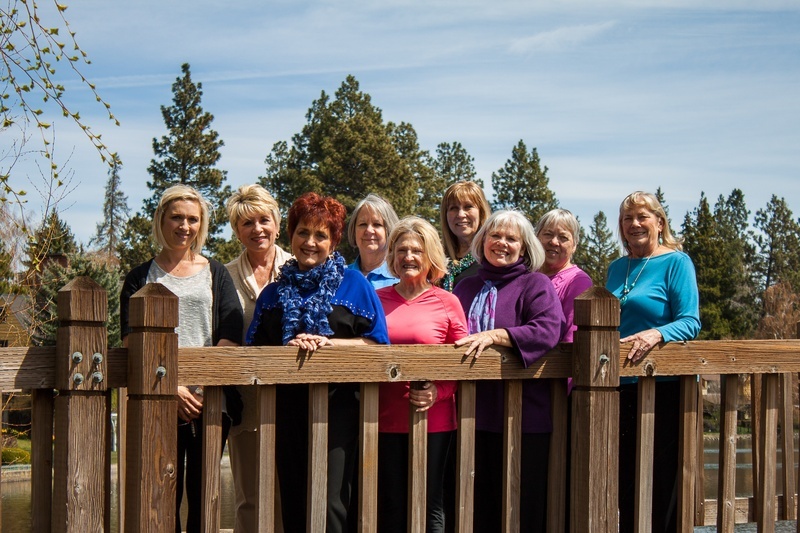 Joining Bella Acappella Harmony Chorus and Grandma’s House will be long-time Bend women’s non-profit groups, American Association of University Women (AAUW), Bend Branch, and Soroptimist International of Bend. The purpose of Harmony4Women is to educate, nurture, support and inspire women and audiences in Central Oregon through a year-long community outreach, culminating in a crowd pleasing fundraising concert that benefits the partner organizations. 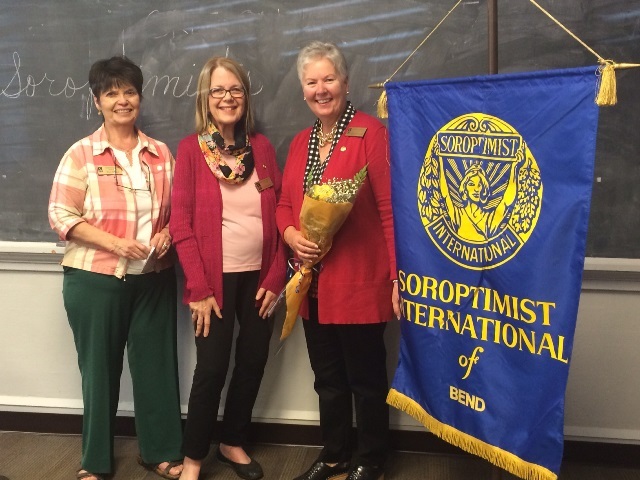 Nancy Ueland, executive director, said, “AAUW and Soroptimist are wonderful additions to Harmony4Women. All four of these organizations draw women throughout Central Oregon and serve women and girls throughout the area. All four are designed to improve the lives of women and girls. They empower, inspire, shelter, and educate women and girls. Their goals blend nicely with the Harmony4Women mission.” Together the groups will present two Harmony4Women Acappella Concerts, their fifth annual offerings, at the Tower Theater in Bend, on Saturday, November 22, 2014, after 8-10 weeks of practice and bonding as the Harmony4Women community chorus. Since 1881, The American Association of University Women (AAUW) has been the nation’s leading voice advancing education and equity for women and girls through advocacy, education, philanthropy, and research. 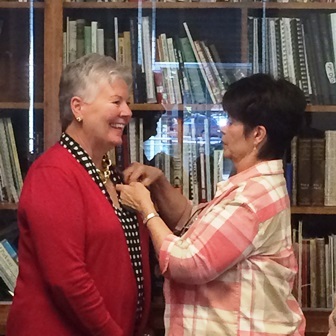 AAUW offers grants and awards, nationally, and the Bend Branch, founded in 1931, gives scholarships to COCC students continuing their educations in a 4 yr. program, through their Charles and Helen Weil Scholarship Fund, and it offers middle school girls an introductory program in STEM fields, science, technology, engineering and math, toward preparing them for careers in these fields, in partnership with the Girl Scouts of America. Soroptimist International, founded in 1921 for business and professional women, is a global women’s organization whose members volunteer to improve the lives of women and girls in local communities and throughout the world. Locally the group supports projects including a Community Baby Shower for low income families, Hats Gloves and “soap bunnies” for Head Start children, support of local shelters housing women and families, advocacy and support for victims of human trafficking, and economic project support, such as “Bras for a Cause”. Original members of the Harmony4Women Team are Grandma’s House, a non-profit home and outreach program that provides safe shelter to homeless and/or abused pregnant, parenting and adopting girls between the ages of 12 and 19, and Bella Acappella Harmony Chorus, committed to singing 4-part barbershop acappella harmony with joy and passion, and to achieving musical and performing excellence through mutual respect, dedication, education and community outreach. Together, these four dynamic groups join harmony to provide cooperation and visibility for the causes they support. Joining together to “sing for their sisters” they all become Harmony4Women, providing a unique opportunity for both friend raising and fund raising. More information on the program and sponsor opportunities can be found at the partner websites, at Harmony4Women.org, and on Facebook pages, or by calling 541-383-3142. Harmony4Women Team Members: Alison Garner Mata, Dana Barron, Connie Norman (director), Sarah Elmer, Mary Howard, Woody Medeiros, Nancy Ueland, Margaret Wyman, Linda Gardner.